Every year at about this time, downtown Atlanta, Georgia, is filled to the brim with young, colorfully costumed robot enthusiasts in town for the FIRST competition. These kids are on the cusp of a robotics revolution, because the machines are truly hip right now; they can be found adorning store shelves, song lyrics and snarky T-shirts. As long as humans have walked the earth, it seems they have dreamed of creating automated machines that can get work done - often, work they hate doing or find repetitive or dangerous - while silently hoping that the 'bots won't get all passive-agressive about it and start starting something. And what if they take over? We're in the midst of National Robotics Week, so let's delve into popular culture and take a look at this fear and fascination with simmering robot passions. The desire to make automated machines goes back as far as human history itself. Historians and mythologists will point to symbolic robots like Talos, a bronze man incorporated into Greek mythology who was built to protect Zeus' love Europa in Crete. He was both stronger than a man and also able to take torture that people would find intolerable. Much later on, Leonardo da Vinci was experimenting with an automated humanoid robot that looked like it was a knight's armor. There's a long history of robotic aspirations throughout the years, but the point is, humans want to make machines that kind of look like them and can do things. And when these robots dip into the uncanny valley, where they sort of look human and sort of not, that's when they get a little creepy. It was roboticist Masahiro Mori, in fact, who coined the term in a 1970 writing. And thus, humans grapple with the idea of a robot that is almost human in contrast to a robot that is cute and charming (a la R2-D2 from Star Wars, Johnny 5 from Short Circuit and Wall-E). Many robots nowadays are designed to be cute for this very reason. CNN iReporter Fatina Chau sent us a photo of an adorable and hardworking robot being tested in Shanghai, China, while another iReporter, Veera K., showed us a robot that dances to cute music while serving food in a restaurant in Bangkok, Thailand. Visitors order their food on a computer panel. These robots aren't threatening, and yet the latter robot could threaten to replace waiters. It's no wonder humanoids are ambivalent about their creations. 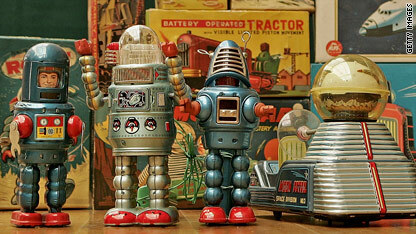 Popular culture portrays robots as scary when needed. On TV, Craig Ferguson (or Craigy Ferg, as he's known on the Twitters) lampooned his show's budgetary constraints by creating an ongoing comedy segment featuring a robot skeleton sidekick. This robot is a bit scary-looking, but it's learning. This of course puts the contrast with a human sidekick in stark relief. We love and hate our robots, and that's why we're always doing the robot dance and singing along to that song "Mr. Roboto" from Styx's 1983 album "Kilroy was here." The song prominently features robots, including the oft-repeated phrase "Domo Arigato, Mr. Roboto." If you're following the plot, Kilroy escapes from prison by pretending to be a robot prison guard. Also, one of the albums on frequent rotation in my playlist is 2002's "Yoshimi Battles the Pink Robots" by The Flaming Lips, which very specifically delineates a fight against pink robots. Although the songs themselves aren't necessarily following the same kind of "Kilroy" story, the robot-esque battle depicted on the cover is attention-getting. We love our robots but secretly fear and loathe them. So, take a moment right now - yes, right now - to stop everything and do a little robot dance, and then tell us: What do you think? As mobile phones and video cameras get cheaper and more ubiquitous, it’s becoming easier for people all over the world to tell their stories. Think about recent events in Haiti, Iran and China. This trend was part of the inspiration for a recent CNN iReport assignment called “A Walk in Our Shoes,” in which CNN.com asked its readers to film one-minute videos of their favorite places to walk. We received more than 470 submissions, from six continents. And that doesn't include one late submission from Antarctica, which is definitely worth a look. CNN stitched many of those videos into a collective walk around the world. The project follows in the footsteps of many other online collaborative art projects, like the Eternal Moonwalk, “Star Wars" Uncut and inbflat.net. And it’s not finished just yet. All of the videos submitted as part of “A Walk in Our Shoes” are available for download, and CNN is asking people to edit their own mashups. Never been to Africa? You could click on the “walk_africa” tag and find all of the submissions from that continent, including a stroll through central Madagascar and a bus stop in Swaziland. Download the ones you like, edit your own walk, and then submit it to this iReport page. Also, we're sharing all of the data we collected about these walks on this public Google Doc. Some useful tidbits from the spreadsheet that could help you with editing: We asked people to use one word to describe their walks; what the temperature was; what time the video was filmed; and exactly where they were shot. Let us know if you have questions about the project. Thanks so much for participating, and happy editing!